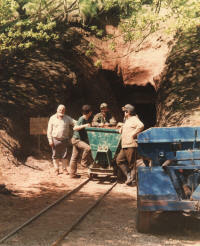 Ever since the Club took on the lease of the Alderley Mines, members have been trying to extend the known length of mines. This work was mainly concentrated in Wood Mine until 1975 when West Mine was reopened. Work within West Mine continued for several years but very little has been done in recent years. In Wood Mine, the main target was to gain access into the Hough Level that connects all the mines (except West Mine). The first breakthrough at Temple Shaft was in 1972 but this did not give the results expected. The next breakthrough was in 1976 but again the explorers were stopped after a short distance at Stump Shaft. In 1980, we were able to enter a new section from Stump Shaft where a tree stump had slipped into the shaft, preventing it from filling up altogether. This was the first major break giving access to a large section of the Hough Level between Wood Mine and Engine Vein. On the way to Brynlow, a partial blockage was met at Field Shaft but an attempt to clear the shaft was unsuccessful at the time. Remains of the boat used in the level in the 1930s were found and have been protected. In 1981, the National Trust and Cheshire County Council decided that Engine Vein should be made safe and it was duly covered in concrete, a doorway was made and the DCC was invited to add Engine Vein to the lease. Encouraged by the finding from below of more workings in Brynlow than had been expected, the ancient workings in Brynlow Dell were opened up in 1982 through a hand-picked passage that was relocated by using the abandonment plan of 1878. Bear Pit at Engine Vein This shaft was filled to near the surface in the 1960s and then capped with concrete. Exploration of the lower passages was obstructed by the fill in the shaft so it was decided to clear it from the top. Wood Mine Some passages were back-filled to the roof by the miner. These rarely went into a further extension of the mine but we still need to check this by careful excavation of sufficient space to enable exploration. Hough Level At the northern end of the Hough Level, we were able to dig a crawling way out fairly readily but enormous amounts of sand hand covered the passage and it was far quicker to remove this with the digger. In 1983, serious digging started in Engine Vein to try to re-enter the Hough Level via Blue Shaft but this failed because of the amount of material that had run in. 1984 saw excavation at Car Shaft at Brynlow (90 feet deep) but this did not give access to any new workings. In 1985, it was the turn of Square Shaft, halfway between Engine Vein and the end of the Hough Level. This was the first fully mechanised dig and the bottom was reached in a few months after clearing 170 feet of sand and soil. Opening Square Shaft meant that in 1986, it was possible to locate and reopen the Hough Level adit entrance. By 1987, digging had started in earnest in the Hough Level to clear the passage the whole way to Engine Vein, showing that the level had been dug in two periods, a fact hitherto unknown. At the same time, a small dig had been started on Temple Shaft, the blockage that had originally prevented access to the Hough Level from Wood Mine and which had started to run in from the surface. This dig was completed by building a concrete shaft from the rock surface up to the field level. By 1988, a shortage of good rail had detracted from the interest in the Hough Level, despite the fact that a diesel locomotive had been loaned to the Club by the North West Water Authority to enable us to haul the fully loaded tubs out of the mine. Instead, the Bear Pit at Engine Vein was dug out from top to bottom in one of the biggest digs yet. When Bear Pit had been practically completed, attention moved again but now to a shaft known as Ring Shaft at the other end of Engine Vein. This shaft was dug down to the level of Engine Vein and connected to it. In 1991, work restarted on the Hough Level and by early 1992, this had been connected to Engine Vein at the bottom of Blue Shaft and Bear Pit. Rail was laid through the Hough Level to the ore chute at the bottom of Ring Shaft which was cleared from the bottom upwards, completing this project. Diggers then returned to the higher levels of Engine Vein and started to clear the passage heading away from Bear Pit in the general direction of Wood Mine. On the way, Balloon Shaft was located and capped with concrete. Up till this time, it had only a wooden capping! A temporary delay took place in early 1994 when another Engine Vein shaft, Plan B Shaft, started to run in and was concreted over and cleared out. In 1995, digging was commenced at Pot Shaft but was stopped abruptly when a hoard of Roman coins was found in the dig. This shaft was subsequently dug out in 1997 under archaeological conditions and evidence found to prove mining was carried on in the first century AD. Since 1996, there have been a number of minor digs but none of real significance until in 1999 when permission was obtained to excavate the Saddlebole Mine. This had been left for some time as the Club was aware that it would have to be dug under archaeological conditions in the same way as Pot Shaft. A dig was started at the existing crawling entrance which was converted into a short shaft and the main chamber was then cleared. Close examination around the area showed many more mining features than had been suspected and a shaft was found which had merely been capped with a rock. Also in 1999, work by the NT on the visitor centre revealed the shaft into the Cobalt Mine which had been located from below. This was dug out to 40 feet and named "Tom's Shaft" in honour of Tom Fowden. In the summer of 2000, an extension was made in Engine Vein giving access to the west towards Beacon Lodge. The passage open so far extends roughly halfway to Beacon Lodge and the end coincides with an obvious shaft on the surface. This passage appears to date from the early 19th century and shows considerable similarity to the workings in the Cobalt Mine. The remedial dig on Timber Shaft in Wood Mine (which ran in during 1999) is nearing completion providing a second exit to the mine. In common with the other shafts on Wood Mine, Timber Shaft had been filled with domestic rubbish during the 1960s so the main finds were teapots and enamel saucepans. Number 1 shaft at Engine Vein was stabilised in 2000 and work has resumed on digging this under a consent from the Department of Culture Media and Sport as it lies within the Scheduled Ancient monument. Number 3 shaft at Engine vein subsided a little over the winter of 2001-2, despite being untouched by the Club, so remedial work was carried on at the surface with consent from the DCMS. In 2004/5, the Club has worked with the National Trust to establish methods for deciding which digs to pursue, which to leave and, where digging is going ahead, how to manage it to protect the archaeological evidence. In future, it is likely that the reducing trend in activity will continue except where excavating can be justified. Instead, it is probable that more emphasis will be put on investigation and conservation of the mines that are now open.